Some say the British prime minister's days are numbered after last week's disastrous election. 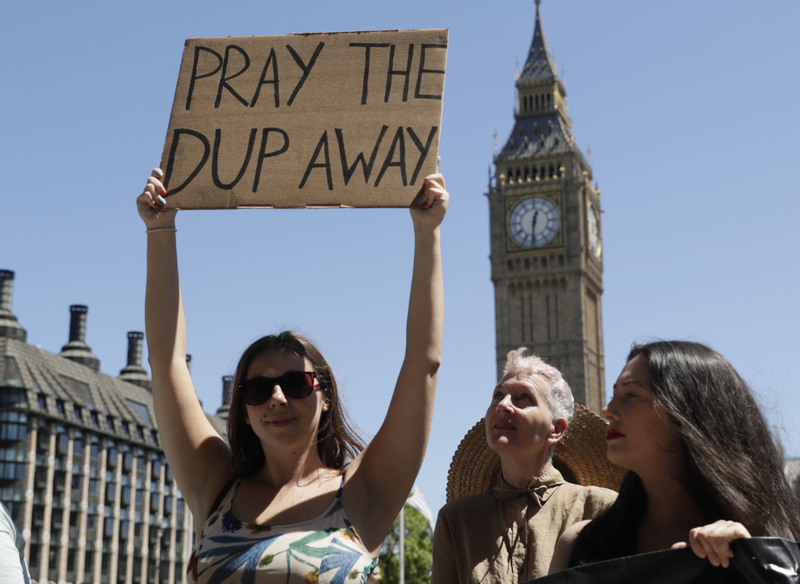 LONDON — Embattled British Prime Minister Theresa May appointed ministers to her shaky government Sunday, as some Conservative colleagues rallied to support her – and others said her days were numbered after last week’s disastrous election. A stream of senior lawmakers entered May’s 10 Downing St. office Sunday afternoon, to learn what roles they had been given in government. May’s weakened position in the party ruled out big changes. All the most senior ministers – including Treasury chief Philip Hammond, Foreign Secretary Boris Johnson, Defense Secretary Michael Fallon and Home Secretary Amber Rudd – kept their jobs and there were few changes in the Cabinet lineup. Damian Green, a lawmaker in the pro-EU wing of the party, was promoted to first secretary of state – effectively deputy prime minister. May also reappointed an old adversary – Michael Gove, a former rival for the Conservative leadership whom May fired from the Cabinet when she took office last year. The pro-Brexit Gove was appointed Environment Secretary. May shrugged off suggestions her days in Downing Street were numbered. But rumors swirled of plots to oust May. Johnson – a former Tory leadership contender – denied he was planning a leadership challenge. In Thursday’s election, the Conservatives won 318 of the 650 House of Commons seats, 12 fewer than the party had before the snap election, and eight short of the 326 needed for an outright majority. Labour surpassed expectations by winning 262. Former Treasury chief George Osborne – who was fired by May last year – called May a “dead woman walking,” and Labour leader Jeremy Corbyn said he was ready to contest another election at any time. Many senior Conservatives say May should stay, for now, to provide stability. But few believe that May can hang on for more than a few months. “I think her position is, in the long term, untenable,” Conservative lawmaker Anna Soubry told Sky News.